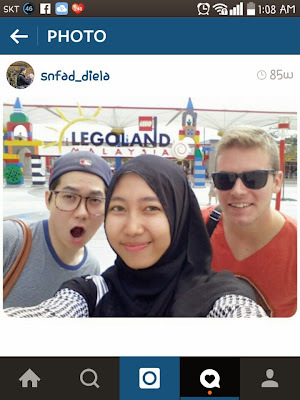 If you're looking for Malaysian student in Korea to help you travel around Seoul, you've found one here! 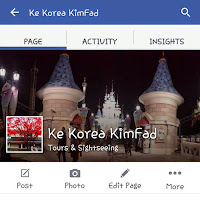 We offer you GROUND PACKAGE/daily tour guide mainly in SEOUL. Price is for 1 person, DOESN'T INCLUDE FLIGHT TICKET. 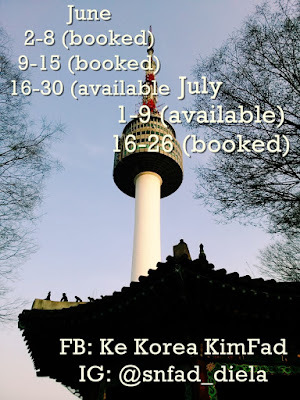 1 year exchange student in Seoul. Able to speak basic and survival Korean. Fluent in Malay and English. Extra points: not bad at taking photos. Married to a Korean. Thin but fit. Excellent at shopping. Besides Fad, Kim will take turn of guiding the guests around too (since both of them are students). Born and raised in Korea for 26 years. Extra points: good with kids. Friendly and bubbly. 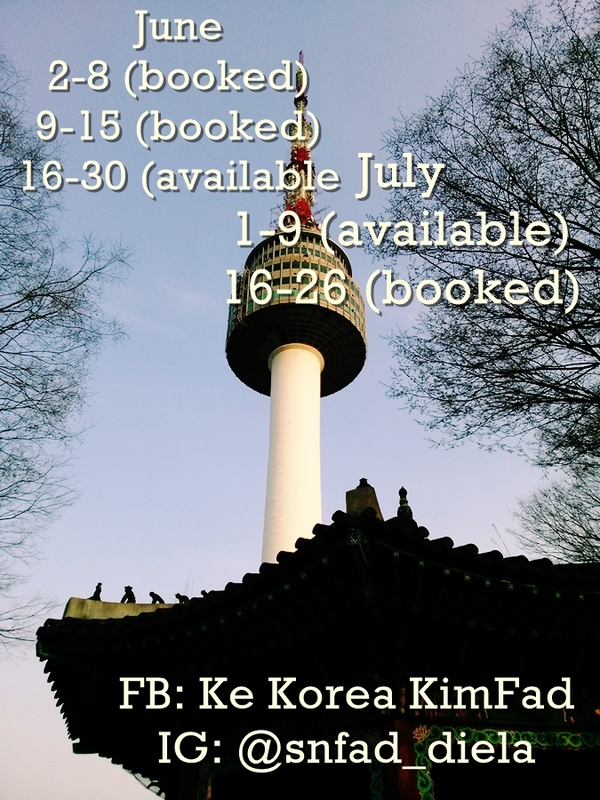 Open to sharing Korean culture. Sebabkan Air Asia tengah ada promotion (return ticket RM600 JE!! ), Fad pun nak buat PROMOSI RAMADHAN & TERIMA KASIH 30K followers (on Instagram). HARGA PROMOSI HANYA UNTUK TARIKH DALAM GAMBAR. 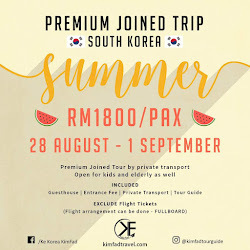 Guesthouse, Korean meals at muslim-friendly restaurant, PUBLIC transportation, entrance fee, airport transfer (airport bus 4pax and above only) and guide are included. Flight ticket & personal expense (aka shopping). FULL ITINERARY Fad bagi hanya selepas booking. Sebab kadang-kadang ada yang nak tambah itu ini so entrance fee mungkin ada bertambah sedikit. This post is dedicated to my future self and kids. Kids, do you wanna know how I met your father? It might not be as long as 8 seasons of a sitcom or something fancy but it's still one of the memories I cherish. Let's start with the first meeting. I greeted him in Korean "anyeonghaseyo" and he said "oh you speak good Korean". Trying to show off I said, "I even know 18, Gae*eki (curse words in Korean)". Until today, your father will bring this up- that I cursed to him on the very first meeting lol. His first impression of me must be that I'm rude. Mine was oh wow he can speak English better than any other Koreans I've met before. And that's that. No more. Nothing like omg he's handsome I'm melting, no. As we had meals together with other international students, we got more comfortable with each other and we started to hang out in the library. Your dad is a hardworking student. I bet he can stay in the library for 24 hours to study and study and study (we did that a few times, staying in the 24 hour room to do assignments). I thought maybe if I study together I can be a hardworking student like him so we always meet at the library. Months later, we got really close. He's the closest brother I had so far. He confessed that he loves me. "WHAT THE... You must be kidding? You're Korean"
"So? I'm a human too"
My parents won't believe it. Then he talked to them about marrying me. "I really like Fadhilah. I'm serious and sincere about her so I wanna marry her"
3 months later, we did a humble akad nikah ceremony attended by close relatives and friends. So, that's how I met your father. But life has to go on... Here I am.. trying to share my last month's strawberry picking experience. Out of Seoul, waiting for the bus. Been waiting for about 20mins, heck let's hail a taxi. Now, the strawberry cookies making! I was worried that we need to give up some of our strawberries to make the cookie dough but no, we just need to bake it. Easy peasy yaw. Apparently, not that easy for this guy huh? The cookies might not look mouthwatering tapi jangan pandang sebelah mata wo. Biskut tu boleh kira macam biskut raya sedap dia. Kurang sikit je sedap dari Famous Amos. Ngeh. Anyways, let's see if I can update more soon. When our newly-wed friends, Yusra and Ryan came to Seoul for their honeymoon, we brought them to Rail Park and Jade Garden for a so-called-Korean-dating experience lol. Were immersed in cycling, we didn't take a lot of pictures in the beginning. These are some of the pictures we gotta take in the mid-point of the track. After a lil bit of exercising (I have to be honest I didn't cycle much. Sempat meracuni fikiran Yusra dengan "Let the men do the work" haha), we went to Jade Garden (about 15 minutes away by subway and shuttle bus). It was our first time too and we liked it. It took about 3 hours to walk the entire garden. It's not that big but because we took a lot of pictures (every inch as we could lol) so yeah.